Our email marketing training and coaching programmes help you get better value out of the time and energy you invest in building customer relationships. Email marketing training shows you how to increase your open rates, build content that gets read (and forwarded) and how to design relationship programmes using email to boost your brand as well as generate sales. This online classroom supports managers taking The Email Academy and ERM Academy with additional resources. Ask your Academy Manager or Project Manager if you need more information. Getting your email to cut through is a big challenge for marketers. But by stepping back from thinking just about email deliverability and spam filters, marketers can change their whole responsiveness by boosting how email really works in their campaigns. In your training we explore best practice in email marketing, show what drives audiences and responsiveness to email campaigns, and what the key issues are for creating stronger and more powerful email marketing plans. How can you use the subject line? Who should you send it from? And why having permission to email does not always mean having the person’s expectation for the mails you’re sending. Advanced email marketing coaching builds specific programmes for brands and shows how to integrate email into social media to build rich integrated marketing campaigns. Do you have questions for your ERM tutor? Is there something that was not clear in the workshops? Are there new challenges now you are deploying this in your business? Is there a new point you would like to make? Use this space to make comments and to ask your questions. Here are a few examples of how the email open rates vary between sectors. It’s a report by email specialists MailChimp and it gives an indication of what to expect in any given email campaign. This is useful background but remember the success of your own campaigns will rely on the quality of your list, the value of the information you send and the skill in writing subjectlines and overcoming delivery issues. Most email marketing technology providers will be able to give you robust templates that will help speed up the publishing process. Here is an example of what’s available from one of the many suppliers. As you read through their notes, think about what your template needs to include, balancing the desire to include lots of messages with the reality that the simpler the message, the better the response. There are several free email templates developed by their team and the thumbnails will show you what the format looks like. These templates are designed in an e-newsletter layout but different structures may be needed for different types of marketing goals. They’ve also included a few pages of introduction to HTML in case you want to learn more about hacking into email templates and changing some of the formatting. Remember that email publishing and marketing can be used as an entertainment channel as well as a direct sales tool. Many brands only see email as a way to push for immediate sales, but smart marketing-centric firms like LastMinute.com have found ways to build brand, engagement and discussion through email relationship marketing. Whether you’re in the travel sector or not, try signing up for their mailing programme to see how they talk with their customers. Review all your consumer touchpoints. Think about the potential for social media sites and platforms like Facebook pages. These have relationship mechanics within their sites and networks (such as the feeds ‘fans’ of a brand see on Facebook), but the pages can also be used as a way to recruit people into more structured eRM programmes. Look for viral opportunities to have your own messages forwarded on through the social networks of your customers and don’t forget the potential of offline channels to play a key role in recruitment. Before you begin or relaunch your eRM programme, think about all of the objectives the organization and the ways eRM can help. As your ‘owned media’ channel it’s the most cost effective way to communicate with people who know your brand, but that communication needs to be segmented so it’s always relevant to what the person expects. Regular customers will expect different messages to those who rarely buy through you and different groups of customers will be interested in different aspects of what you do. When you are setting objectives start with this simple list, and ask your Academy Manager for more ideas as you progress. We were tracking the Obama campaign from the start and interviewed several of the campaign team. Email and social media played critical roles in the process of moving the political agenda throughout the campaign. This was an incredible eRM programme with powerful segmentation based on age, gender, voting behaviour, donations and key political issues. Here you can download a few examples from our full case study on the Obama election. For Hackett, ERM is building the brand, the company image and driving sales through operating as Hackett’s main advertising programme. The company has reduced its print adverts, redesigned offline campaigns for email and delivered them to the target consumer. 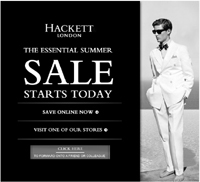 Hackett has also worked to integrated its channels. Analysis of Hackett’s business shows there is a high connection between online advertising and marketing and offline sales. For example, people see the advert by email but go to the store to buy, which for the purchase of luxury clothing products, is normal behaviour. Furthermore, each new range of clothes or upcoming social event gives the company a new reason to reach out to consumers. The outcome of Hackett's effective ERM programme is a high rate of retention. This is essential for the company to operate as a luxury clothing manufacturer, as these customers could easily be worth €5,000, with high value customers being worth up to €15,000. 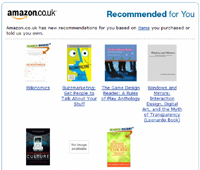 Amazon delivers a personalised service by sending the right message to the right person, not any message to everyone. The company understands what the customer is interested in and makes it relevant at the right time in order to drive sales. Building trust is also key to their success. Branding has taught the consumer that Amazon is big, cheap, and charges no postage. It has also reassured the consumer that Amazon is the best value for money, so they don’t shop around. Effective implementation of ERM has led to customers trusting the company and its processes, which means that customers are happy to leave their credit card details and shop in safety. Amazon’s site itself employs a simple but powerful search engine, to allow customers to find items quickly and efficiently. Furthermore, the Amazon service and customer care centre keeps purchasers informed about postage status. This strong customer service is key to the repeat purchase. The end result, as a combination of the factors listed above, is Amazon retaining its customers - people who shop on the site are customers for the long term. British Airways employs ERM to deliver key messages and overcome challenges the brand has, such as lost luggage and long delays. ERM is also allowing the brand to tell a story over time. These stories can be rich and deep, allowing the company to explain in greater detail a number of aspects of its business. 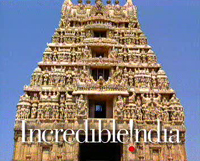 Furthermore, British Airways has integrated its channels. The company’s ERM process is perfectly linked into their advertising on television, radio, press, web and direct mail. Not only does it operate in tandem with offline media, but email is also boosting the effectiveness of messaging in other channels and creating an overall increase in ROI. ERM further functions as a tool to find new reasons to reach out to the customer. LastMinute.com has built its brand through the web. Their use of email has helped create discussion and engagement as well as building sales and driving response for key promotions. In this case study we look at some of those promotions and how they use short term offers to drive response as well as building awareness of the nature of their offers and building the LastMinute.com brand itself. Reading through the language in their eRM programme it’s clear the brand extends its tone of voice and engagement from the website into email. The same approach and structure is used in their social media and the programme has clearly built revenues and conversions since before the web became the main focus for the travel industry. 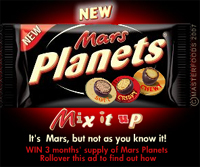 This expandable banner was both a game and achieved data capture for the Mars brand. Targeted at 18-34 year olds and running on high impact spaces such across the MSN portal, Hotmail and MSN Messenger, it’s a good example of how heavyweight partnerships with a single media owner can build massive campaign reach and achieve the type of audiences that traditionally only television could deliver. Betfair is the world's leading online betting exchange. Taglab designs and produces their monthly "In-Play" newsletter. The contents include opinion pieces, event previews, community content, analysis, competitions, hints and tips. The newsletter combines an email and microsite, achieving consistently high clickthrough rates. 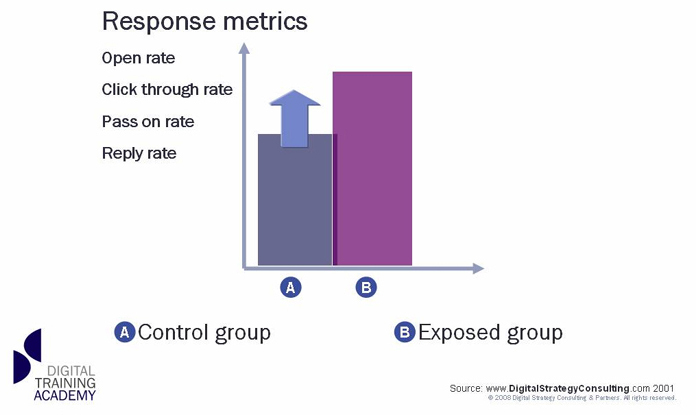 In a recent issue, 36% of those opening the email clicked through to the microsite. William Hill’s core business is the provision of gambling and betting activities. To do this successfully, it is imperative that they constantly acquire new registrations of people wanting to bet via the William Hill web site. 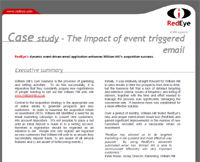 In order to maximise the acquisition return on investment (ROI), William Hill used RedEye’s profile and segmentation rules to dynamically generate segments and email cells is a very effective solution to make email marketing timely and highly targeted. Use the name of your brand within the subject line to boost relevancy and authenticity. Remember that emails that are not opened can still have a positive brand impact so use this opportunity to boost recall and front of mind awareness. Make it simple and instantly easy to understand. Make your subject lines ‘decodable’ so in the instant someone opens their email they can understand what the offer is about. Use email as the gateway to deeper messaging, offers and data capture within your website. Take the customer to exactly the right page within a single click; apply a deep link strategy to everything you do. For retailers using email with customers think about what to do with the customer who doesn’t click. Try create a second mailing with a new subject line; mail this to a sample of people who didn’t open the first and look for uplift and sales response. Let your findings govern your email strategy. Avoid ‘one size fits all’ email marketing messages, but actively harness ‘one template fits all’ approaches. Use standardised templates to boost the efficiency of your email production and the ease of reading and interpreting among regular receivers of your communications. Find simple mechanics such as swapping story hierarchy or photos to talk appropriately with different target segments. Never send emails from ‘info@company.com’. The from field defines the trust a customer has in the relationship with a brand so look for meaningful ‘senders’. Consider brand icons, senior directors or celebrity endorsers. Avoid sending emails from a box that is never checked or preventing consumer replies from being heard. Not listening to customers speaks volumes about a firm’s attitude and is certain to provoke customers discontent with your products into greater depths of despair. Share knowledge and learning from other internet marketing training courses we’ve run. These online classrooms are the most relevant to your training programme for digital skills.